With the air of high society that fancy finger food and wine inevitably provides, the Social Kitchen at Hyde Park Corner’s Exclusive Books provided an unusual venue for the Annual 2017 ProBono.Org Awards. However, on the evening of 7 September amongst the name tags and high fashion, a more pervasive air of humility filled the room. It was a time to honour those who ordinarily seek not to be honoured and who, at all costs, would avoid the limelight if they could. The first award for the evening, in the category of refugee law, was awarded to CDH and graciously accepted by Jacquie Cassette, Director and National Practice Head for the Pro Bono and Human Rights practice, on its behalf and on behalf of the Pro Bono Practice. 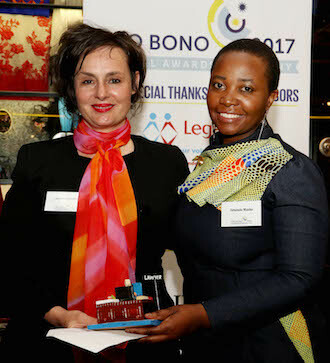 The Pro Bono Practice has been working tirelessly on matters for a number of clients many of whom hail from the Democratic Republic of Congo and Angola. Having been unlawfully denied formal refugee status and asylum papers at the Refugee Reception Office (RRO) upon entering South Africa, our clients have sought our legal assistance with the appeal of these RRO decisions. The CDH Pro Bono Practice assists with appeals against these decisions before the Refugee Appeal Board (RAB). Extensive and intensive client consultations, sometimes with language barriers, the drafting of papers and liaising with the relevant government entities are all in a day’s work for this team. Members of our Practice also represent clients during arduous hearings before the RAB. More often than not, the decisions of the RAB require review as they often have no basis in law or in fact. Here, the Pro Bono Practice assists with the institution of the required legal action, covering the ground work as well as instructing highly regarded counsel for argument before the courts of law in deserving matters. The gratitude of our clients is evident when the Practice for example, succeeds in an urgent application for them to obtain lifesaving medical assistance in the face of being unlawfully denied refugee status and thus the medical treatment to which they are entitled in terms of the Refugees Act. In addition to RAB appeals, reviews and urgent applications, in appropriate instances, applications for permanent residence under the Immigration Act as well as the Citizenship Act also fall into the bounds of the refugee work undertaken by the CDH Pro Bono Practice. The Practice, which regularly staffs the refugee law clinic, was also requested by ProBono.Org to produce a Guide on Judicial Review (the Guide) in the context of the refugee/asylum seeker adjudication process. The Guide has been completed and forms part of a larger project undertaken by ProBono.Org that aims to equip other attorneys from partner law firms that assist with the refugee law clinic with a basic overview of refugee law and related matters in order to enable them to more effectively advise clients at the clinics. As was highlighted by the guest speaker former Minister of Finance Pravin Gordhan, in a society which according to the latest Gini – coefficient, is one of the most unequal in the world, and in which people’s statutory and constitutional rights are sadly regularly being flouted, pro bono lawyers play an important role in assisting the poor to enforce their rights and to hold institutions accountable. In so doing not only do they assist in promoting the dignity of those affected, they assist in promoting the very stability of society. As Mr Gordhan drove home, an unequal society is an unstable one and affects us all. From generation to generation, South Africa remains one of the most unequal societies in the world where poverty is almost a guaranteed inheritance. Against this backdrop, activism in the form of pro bono work retains its relevance and its significance. It is an equalising force. When the most vulnerable in society are assisted by the law, they are more likely to trust the law and the basic tenet of ‘no one is above the law’ becomes a reality rather than a hoped-for ideal. The annual ProBono.Org awards may not solve all the country’s problems but a little bit of recognition goes a long way to encourage the attendees to continue with their work in assisting vulnerable members of our society in circumstances where very often all other institutions have failed them.